Home / Movie Premieres / TIFF A Simple Favor Screening Premiere! Anna Kendrick! Ryan Reynolds! Blake Lively! Christian Louboutin! And More! TIFF has been rolling out the Oscar contenders this year! The latest film to premiere in Toronto is A Simple Favor starring Blake Lively and Anna Kendrick. The film is getting a lot of buzz and looks great! Check out the pics from the premiere below! Star Wars: The Force Awakens Art Show At Gallery 1988! 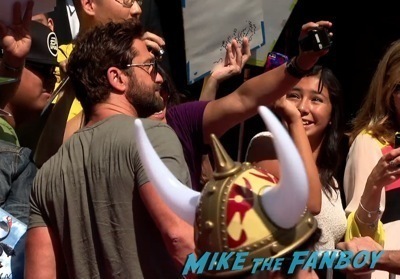 J.J. Abrams Celebrates With The Fans! Hansel & Gretel: Witch Hunters World Movie Premiere! Getting The Big Diss From Jeremy Renner & Gemma Arterton But Finally Meeting Famke Janssen Who I’ve Been Trying To Meet For SIX YEARS! Captain America: The Winter Soldier Premiere Teaser! Check Out A few Photos From The Big Event! How To Train Your Dragon 2 Premiere! Gerard Butler! Jay Baruchel! Kit Harington! Craig Ferguson! America Ferrera!